Heading east. Bouquet in tank cannon muzzle was put there by Mme. Gandon in Paris. 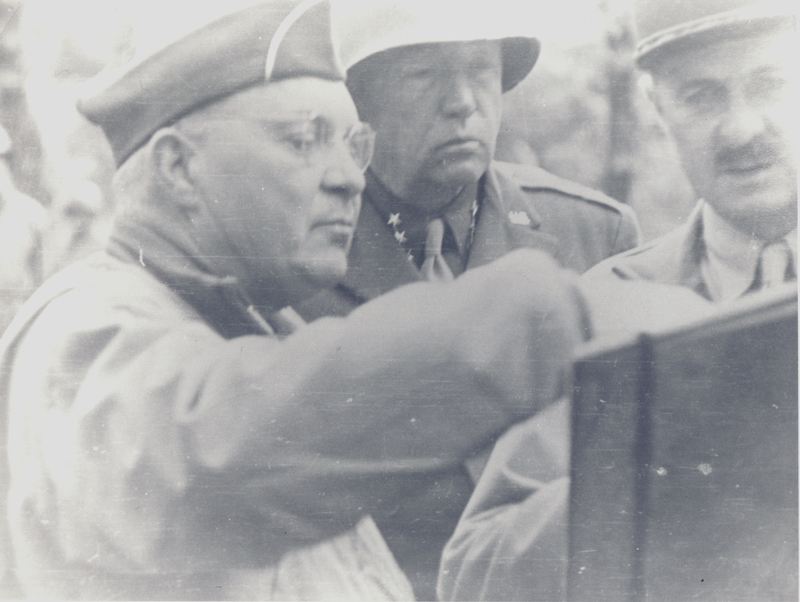 Generals Haislip, Patton and Leclerc confer. Second Company on a ferry. 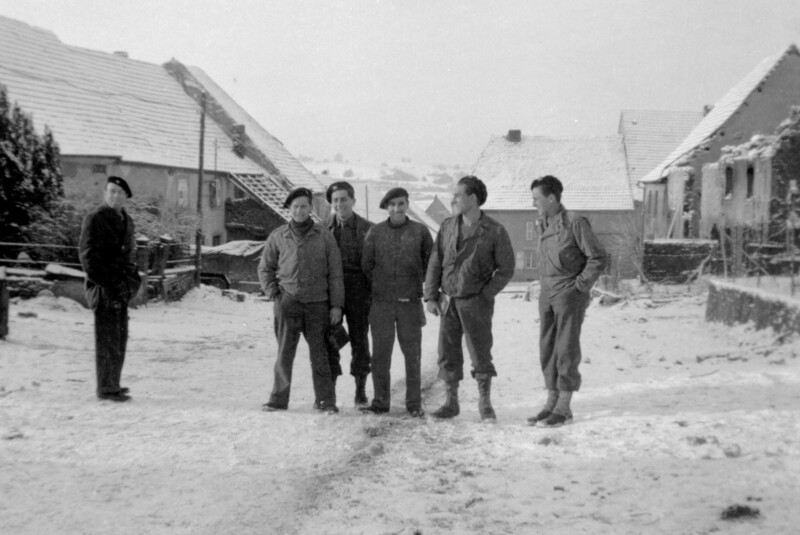 Front Louis Tréguer, behind him Claude Nalpas, top right Philippe Bey-rozet. Near Bitche. L to R Louis le Ray of maintenance section? André Mengual, André Beaufils, Gaston Eve, Marc Casanova et Philippe Bey-rozet. 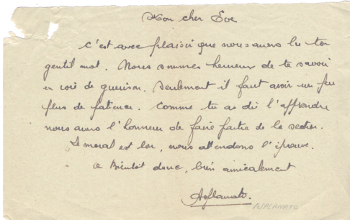 Lucien Asplanato's little note to Gaston. General Leclerc checks troop positions on a map and issues orders. At top, unknown man. Left to right, top row, Georges Brice, Pierre Regnier and Marc Casanova. Lower row, Jean de Valroger, Louis Tréguer, Roland Hoerdt, Maurice Maizières and unknown man. Crouching at front, René Tracqui. Photo Gaston Eve. 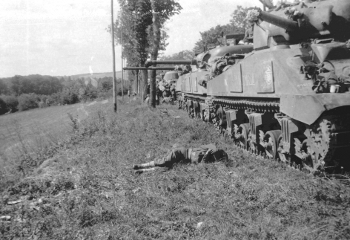 The two tanks immediately after the battle. Leclerc, Selestat after his inspection of the crews. Immediately the crews were put at ease, Dad ran upstairs and grabbed his camera but was a bit too late. Montmirail the morning of the 29th with the small French penant flying. André Mengual at top Étienne Florkowski at the left, Gaston Eve at his post. We had to travel many kilometres to find the front. We arrived at Gerjus close to Villeblevin and returned to our war routine. Late one evening we saw the headlights of a car coming from the German border. Lieutenant Michard and Sergeant Jamette were at post up front and went to stop the car at the edge of the village. In the night they could see on the back seat of the car an officer in fine German uniform. As the car approached there was a pistol shot and I was told later the bullet passed through the side of Jamette's beret. The Lieutenant shot back and killed the men before they could get a second shot. The Lieutenant cut the leather belt and took the German officer's revolver from within. On looking at his papers he saw that the officer was the Gauleiter of the region. On the 1st October we started from Rambervillers. The war had turned very bitter and pitiless, it hadn't been quite as bad up to then. As before in forest, it was a trying time for the tanks. We were back to the business of driving down the road until something stopped you. If you happened to be the lead tank, that was just too bad. The weather was humid but there was no frost. The wooded terrain was not always convenient for us, but we had to pass through it. The Company manoeuvred, advancing through the trees and around the edges towards Anglemont. At one point we were stopped by some American officers. Because they were talking with our officers I got out of Montmirail in case of language difficulties. One of the Americans spoke French. He was very impressed with our tactics and our progress. He spoke to me in English telling me that our attack had been "Superb, absolutely superb!" We had halted by a dense wood, the only possible crossing of which was a road blocked with a barricade of felled trees, about 50 metres in. It was down to us to secure this by-road so Lieutenant Michard asked for a volunteer from each tank. Five of us presented ourselves. I represented Montmirail. 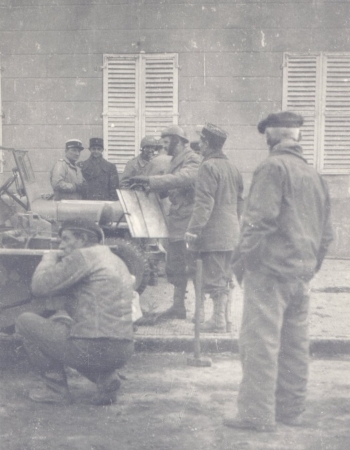 Champaubert was the tank that was to remove the barricade, piloted by my dear comrade Léo Jouhet. On foot there was Sergeant Yves Triolet and four men. Just at the moment we were going to start off a German soldier appeared before us with his arms in the air. He ran to us, then took out his papers. He was Austrian. Only that morning we had found two of our Spahis killed alongside a wall. They had evidently been executed! The Austrian took out a photo of his wife and six or eight children. He was very nervous and talked a lot, none of which we could understand. I had to leave to clear and de-mine the road, I had done a training course in mine clearance while at Sabratha, and as I was leaving I told my comrades not to kill him. Arriving in front of the barricade, Champaubert positioned herself in the middle of the road as the three other comrades and I occupied ourselves putting the cables on and attaching them to Champaubert. [Before Gaston had time to move away] Jouhet's foot slipped on Champaubert's clutch, it moved backwards with a jolt and there was an explosion. When I got up again I realised I had a wound in my leg and another [Sergeant Triolet] was wounded to the head [The log had landed on a mine close by, exploding it]. Lieutenant Michard examined me and told me it wasn't serious. I had a mine fragment in my calf so he put a dressing on me. 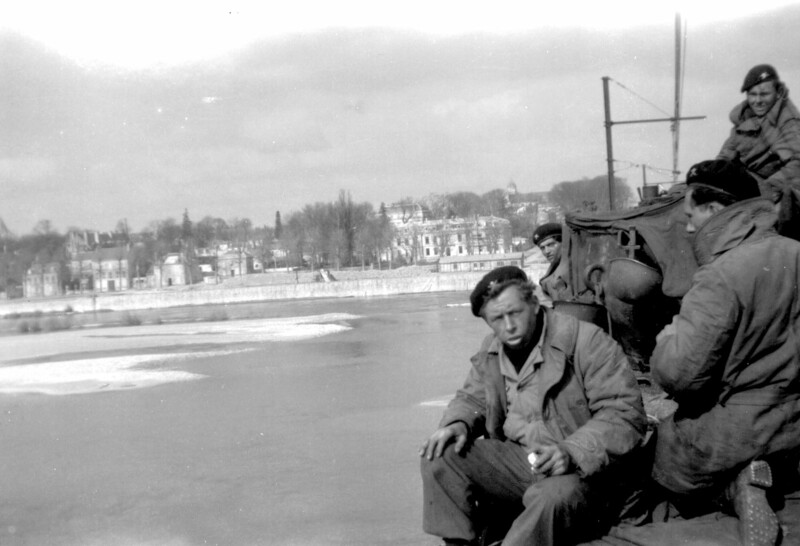 I was evacuated in a Half-Track with some other wounded. Jouhet was desolated, the others too were moved. Yet it wasn't for nothing that I said to Léo "See you later!" The first aid post was on the front line, actually ahead of our position. Upon arriving at the post the stretchers were unloaded and the half-track left. I had the pleasure to be received by men with English accents. It was the Quakers [Pacifists, maliciously put into front line duty by the British military establishment] who had been with us a very long time. I was pampered by them and we spoke English. There were six or seven of us because there were one or two Americans who had been wounded in that sector. Very shortly after my arrival I heard noises very characteristic of German tanks close by, coming towards us. I warned the man who was helping me and everything moved very quickly. [The Germans were counter attacking] There was an ambulance near us. Gently for the seriously wounded, everyone was balanced in the ambulance without stretchers or anything of that sort. The Germans didn't see us but they were very close because the movement of their tracks and noises of their motors were perfectly clear. The ambulance departed at top speed through the forest over rough terrain. One of the Americans was seriously wounded in the shoulder and bled a lot but there was no question of hesitating or slowing, so he suffered a lot. We finally found a road and another wounded American had need of a toilet. He called repeatedly "I want a crap". He suffered in addition to his wound. There was no question of stopping and finally he did it in his pants. He was not happy! I arrived at an American field hospital. Everything was well organised. My leg was given an x-ray and a short while after an American surgeon came into the tent where he would do the operation. He told me the largest fragments were in my calf and he would open the calf by slicing it and extract the largest bits. He told me that the smaller fragments in the rest of my leg could remain there. The operation was done quickly. My calf was frozen and cut down its length with no pain, only the pressing of the knife along the muscle. I was put in a very long tent where there were many other wounded. My leg had been plastered, without which the incision would not have healed. I rested there for two days after which I was transported to the Red Cross Hospital at Lyon. This was another world to me. It was nice and I slept between sheets. After a few days the plaster was removed from my leg following which I was sent to another hospital in the city. 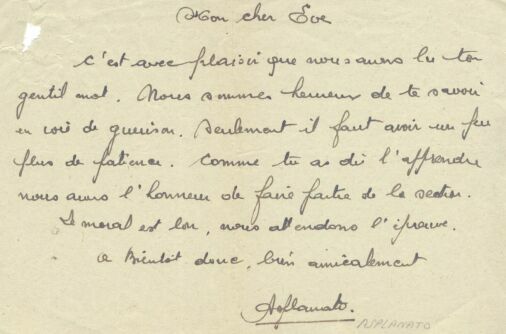 I wrote to Lieutenant Michard and the crew upon my arrival in Lyon and received a reply from the Lieutenant. I met a comrade of the 1st DFL at this hospital and we spent many hours each day together. The doctor in charge of my care told me it would take three months for my calf to heal because it would need rehabilitation. I told him I was keen to rejoin my comrades. He gave me some crutches so I could start to walk because up till then I had been in bed for a dozen days since the operation. I had a lot of difficulty walking because my calf muscle was only just healed and gave me pain when I put my foot on the ground. I persevered each day. I walked with the crutches for several hours each day and sweated a lot from the physical effort and effort of willpower. About fifteen days later I could walk hesitatingly without crutches. A little under three weeks had passed since I had been wounded, when I received a letter from Lucien Asplanato, the pilot of Iéna announcing the news that the platoon had received Iéna as a replacement for Champaubert. I have always kept his few lines. I told the doctor I would like to leave. He was a very kind gentleman and advised me against it. The next day he gave me a document permitting me to quit the hospital. I remember him well. I only had one shoe so I found a barrack or maybe an annex of the hospital where there were some French boots. I took the pair. I passed three or four days waiting at the hospital gate for an opportunity to go back into the Vosges. I benefited from that wait by attending the Lyons fair. I managed to find an ambulance which was going to Remiremont so I hitched. That got a good part of the distance covered. I found Remiremont under snow. I got off at a crossroads and I wasn't very warm because I had been evacuated without a coat. I then had the good luck to see a lorry from our division coming. It carried me into the village. The Company was in the area so I rejoined my Platoon. I found them 400 yards from where I had left them. However the news was very sad. The platoon was missing Champaubert. Lieutenant Michard told me some sad news about which he had not written. On the 2nd October, the day after I was wounded, Montmirail piloted by my friend Marc Casanova had attacked at Anglemont with Champaubert at the head. They were struck hard, Champaubert had taken several hits and Montmirail had destroyed two German tanks. All the crew of Champaubert were killed except the commander. My friend Roger Norcy, the gunner, a volunteer of 1940 who was just 22 years old. Léo Jouhet, the pilot who joined us at the Ivory Coast and who had married a charming lady who was also in her thirties while at Algeria. He would count the days to rejoin her. He was a very courageous man who, when we were together, would sometimes tell me that he didn't think he would survive the war. My friend Georges Renou, a young man of only 18 years had who joined us at Tunis. We had often gone out together on leave days. He was a very nice lad, he wasn't even old enough to drink ! Thomas was also killed and all four were buried on the spot. I don't recall which of my comrades told me, but sadder still, Iéna had also been destroyed. Claude Philippon, gunner and a volunteer of 1940 was killed along with Lucien Asplanato, the driver, who had written to me while I was in hospital. Also killed was Daniel Renou, brother of Georges Renou, who had died in Champaubert. Iéna had been destroyed a few days later, in an attack on Petitmont with Montmirail. Iéna was lead tank and left with Montmirail. It was destroyed by an armour piercing shot from a PAK 75, a very powerful cannon. Seconds after Iéna was hit Montmirail was also hit, piercing the turret shield around the cannon but not the secondary armour on the turret. It was the second direct hit she had taken. It was a miracle that Montmirail was still here, but the armour piercing shell had made a gouge across the carapace of her cannon, after which it had struck the turret without penetrating. The electric circuits also no longer functioned. The turret was welded to the chassis by the force. I immediately set about checking her fuel supply. I found myself at the rear of the tank when I heard the voice of Captain de Witasse who, realising that I had returned to the company had immediately come to see me. It was very considerate on his part and when I heard his voice I stood to attention from habit. My left leg buckled and I felt a great deal of pain but avoided falling. The Captain, with much affection, told me how happy he was to see me return and that I was the first of his men able to return after being wounded. This conversation re-enforced my dedication to serve France. That evening I had the pleasure to dine at the mess with the crew. It was Florkowski who prepared the repast. We then rested a while at the workshops where we received a new carapace for the cannon. The electric circuit was repaired. Lieutenant Michard wrote to us, I still have his letter, asking us to bring back Montmirail because we had a long road to go to reach Berlin! On arriving back with the Platoon I found we had a leave of eight days. I headed for Rouen where I had an uncle and an aunt from my French side. I reached Darnetal by means of hitch-hiking. It was a mad journey! I went to the house I remembered from when I was small, but my uncle and aunt had moved. I eventually succeeded in finding them. Someone told me they had moved into the village, and there I found my aunt who knew I was a soldier because she had received a notification [of Gaston's hospitalisation] from the Red Cross. She recognised me and we went off to find my uncle who hadn't seen me since 1937. He was working in a field. It was a very emotional moment, all three of us shed tears. I was greatly cheered to hear a few days later that the 2nd DB was at Strasbourg. I was very disappointed to miss this event. My uncle made a lovely cider! The day of my departure he gave me a beautiful roast fowl and a bottle of Calvados. I rejoined Montmirail and Lieutenant Michard with much pleasure. We shared my provisions. The Calvados, which I offered to the Lieutenant, lasted a very long time because we drank it in small shots. The Lieutenant always carried a hip-flask of alcohol on his belt. He served it to the wounded or sick. We never drank before combat. We did very well in Alsace. When we did not find ourselves at the front, we would take our meals as a crew together with a family to whom we offered to share. Those moments were very happy. 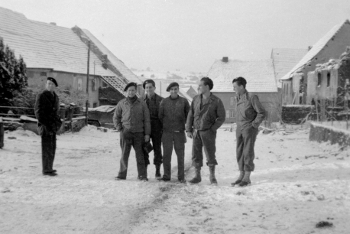 In December the Platoon was sent to a village that had suffered greatly. Destroyed lorries, cars, artillery and tanks were scattered there. Most of the houses were empty. The remaining inhabitants had taken to their cellars, lit by candle light. Our four tanks took guard on a roster. I always slept fully dressed. Once we found ourselves in a convent of sisters who were staying in their cellar, however it felt too awkward sleeping in one of the sisters rooms, so I recovered my sleeping bag and slept elsewhere. The Lieutenant told me he was departing on leave to Ancimet [Close by the village of Doyet.] in L'Allier and he went, full of joy after a six year absence. He returned about the 15th January, very happy to reunite with his family yet not to have missed any combat. It was now almost four years that I had been with him and there was a great bond of friendship between us. He was 34 years of age and I 24. He led a very ethical life and I shared his ideals. He told me that his grandfather was overjoyed to see him become engaged. It was some 36 years later that I saw a photo of the young lady who had become fiancé to Louis for about three weeks. Before re-entering Alsace I had a premonition that the Lieutenant and I were coming to the end of our life together. I wrote to Odette, my little Parisien of the Place de la Sorbonne with whom I corresponded, that fate would not allow us to continue and that either I or the Lieutenant, one of us would be killed. I put aside this presentiment and we left Lorraine at night in a great frost, without headlights and into a snowstorm. This journey through night became a veritable epic for the tank pilots. Ahead was black ice and disaster. Time and again we stopped and the Lieutenant went and checked each crew in turn then returned to the head of the column. Finally it was broad daylight when we arrived at Sélestat. However we had no more than half the tanks in a fit state for combat, many now required repairs. 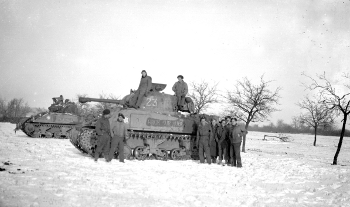 The strength of the 2nd Company of the 501st Tank Regiment was seven tanks on the morning of the 27th January. In Lieutenant Michard's Platoon there was only his tank Montmirail and Arcis sur Aube. The second company left for its starting point towards midday with some half-tracks and infantry . It was cold and a lot of snow had fallen. Our tanks had been painted white for some time. The tanks and half-tracks left in a column on a route behind the front. We arrived at the approaches to the Grussenheim area about half an hour later. At that moment our tanks quitted the road and advanced across fields towards Grussenheim. We arrived at a place where there was a tank of the third company which had been destroyed. The tank showed all the signs of disorder from the hits it had received and there was evidence that some of the crew had survived because the hatches for the pilot and co-pilot were open. One of our comrades was stretched out on the turret and was without movement. We carried on about 200m further and found a large German Self Propelled Gun. It had immediately to its right a large hedge which hid it completely. The front and other side were buried in snow as it was still in summer camouflage. Luckily for us it had been abandoned, without doubt because of the assault of third company. There was no sign of the company we were supposed to reinforce. There was a lot of arm fire of all sorts. We had advanced without damage up to a place where there was a very high and dense hedge which separated us from Grussenheim. This hedge was just about the height of our cannon. Two or three hundred metres further were some woods across which we could see Grussenheim. We had meanwhile received and delivered many rounds which had obliged us to make frequent changes of emplacement to avoid taking a hit. Our infantry were next to us along the hedgerow and though few in number were very active. Conditions allowed us to leave our tanks from time to time to talk or take a snack. At one time I climbed onto the rear of Montmirail with Lieutenant Michard to better reckon the terrain before us. I soon realized what very strong nerves he had as I heard some bullets passing. Sometime after, when we were walking along the hedgerow, we found an abandoned stretcher. We folded it onto the back of Montmirail thinking that perhaps it would be useful to us for taking turns sleeping in it if the opportunity presented itself. Our infantry was very active but without success. I took advantage of a moment of calm to go and see the comrade who was stretched out on the turret of the tank from third company. 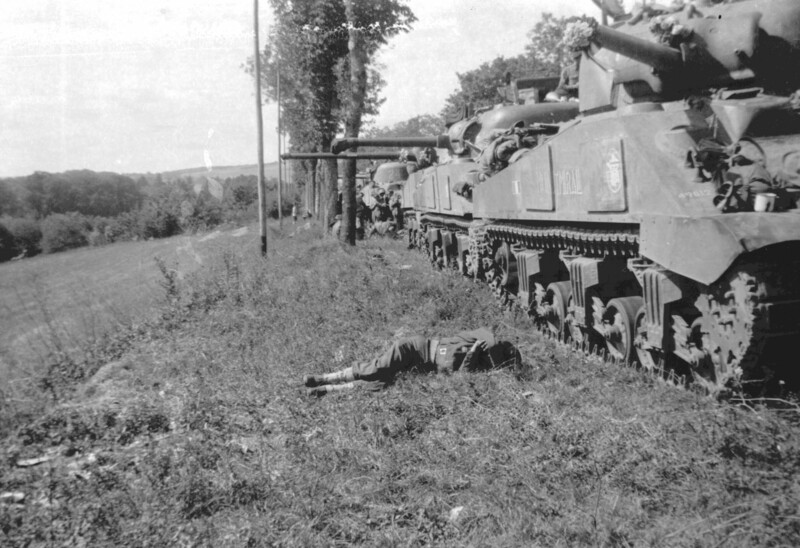 I climbed onto the tank [The tank Chemin des Dames] and was able to confirm that he was dead. I left him on the spot because I found myself under small arms fire while on the turret. I recognized the comrade as a young man called Armand Mager, a companion from Camberley. The night fell without us having made progress and the crew stayed on the spot. We continued to change the tanks emplacement time and again. That night was long, very cold and sleepless. The stretcher was left on the back of Montmirail. The area was illuminated by flares time and again and there was often fire from arms of all types from one side or the other. The Germans counter attacked very strongly twice during the night but we repulsed them. Each attack was lit up by flares but I couldn't see which side launched them. These allowed us to defend ourselves. When the day broke we made coffee and ate. Our morale remained very good and our objective was the same. Our greatest discomfort was having soaked feet because the American boots let in water. The first hours of the morning had been very quiet. A short while after Lieutenant Michard gathered the two crews and told us that we were going to enter Grussenheim by another route to create a diversion. Montmirail, Arcis Sur Aube and two or three half tracks of infantry would rejoin the road they left the day before to find their new starting point. To get to our new starting point we went to Jebsheim, I think. In that village there were many trucks and other war materials not of the Deuxième DB. We saw neither soldier nor civilian during the crossing of the village. We placed ourselves on the approaches to Jebsheim facing Grussenheim which we could see in the distance. There were some houses behind and to the left of us and ahead towards Grussenheim was something like a vineyard which was very high and supported by a framework and many lines of iron wire. To our right was a road that went in a line straight to Grussenheim. There were trees lining the road and at three to four hundred metres to the right of this, also the length of the road, there was very thick woods. We arrived at our starting point towards midday. Lieutenant Michard told us that we were leaving at exactly 13.00 H. From where we were we could see the point where the other two tanks and the few infantry had to attack during the diversion. The day was very clear and visibility good. Before us lay the terrain we had to cross and at the end Grussenheim. The task was obvious. We passed the time taking a snack, washed down with a little wine that Lieutenant Michard had found in an abandoned house. We had little to say to each other but we were very calm. I thought that I, like my comrades, had become used to facing the inevitable with determination. I recall that some among us automatically put their hands together because it was evidently the end of the road for the company. A little before one o'clock Lieutenant Michard repeated to us the goal of our attack and said how to proceed. Tracqui who was driving the Arcis Sur Aube and I for Montmirail were ordered to charge without stopping up to Grussenheim. Lieutenant Michard passed around the hip-flask of Calvados that he kept on his belt and each of us drank a gulp or two. After which he left to cut the iron wires of the vines facing the Arcis Sur Aube and Montmirail so that we could pass without uprooting and demolishing its large frame. At one o'clock exactly we got going at top speed in a line, side-by-side to limit the target as seen from the edge of the woods. Montmirail kept to the right, next Arcis Sur Aube then the half-tracks. We had an element of surprise. During the first 300m there was no sign of reaction from the edge of the woods. At the end of that pause everything changed as we became the target of a considerable barrage from there. 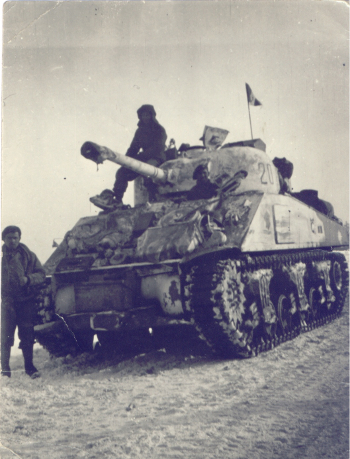 The shells that arrived were armour piercing and ahead of Montmirail, instead of the great explosions of high explosive shells there were puffs of snow thrown up when each shell hit the ground. The terrain was completely bare and looking to my left I could see the same puffs of snow around the Arcis Sur Aube and the half-tracks. Although the terrain seemed flat under the covering of snow Montmirail, running at top speed, was making sudden violent movements and we were unable to reply to the artillery. The speed of our tanks and the closeness of the German guns rendered the task for their gunners difficult so tanks and half-tracks arrived intact although close to the end of the passage we took a hit to the rear. We placed ourselves out of sight of the edge of the woods, Montmirail and Arcis Sur Aube at 100m to the left in the direction which we would attack, the rest of the company and half-tracks remained with us. Lieutenant Michard had got down from Montmirail to talk with the infantry officer and had returned. From the first we had been subjected to a hail of automatic fire and bazooka. The fire was light at first but rapidly increased until it was incessant. The danger was too great for Montmirail to remain stationary so we immediately shuttled the distance to Grussenheim, a distance of 100 to 150m. The very few infantry we had were unable to establish themselves and we saw them time and again in very difficult circumstances and we supported them and they us. From the first Lieutenant Michard had frequently been subjected to fire. As was his habit his turret was open. He wore his tank helmet and over this an infantry helmet which covered his head to just above the eyes. His height allowed him to have his eyes just above the turret and to see all sides. His orders, received by us through the intercom, were always spoken and never shouted and were and remained unwavering. As with many drivers there were times when I could observe all that was going on. Sometimes when the danger was obvious he almost whispered his orders as though they might be heard outside the tank and our manoeuvres anticipated by the enemy. In these moments there was a quiet urgency in his voice, after which he would say" Good" to our gunner, or to all of us, "That was hot!" or something like that. In little time we had used up the turret stock of shells and this process was repeated many times during that afternoon. The turret was turning non-stop and Montmirail never remained more than a few moments in one place. We were constantly receiving orders and time, without our realising it, passed very quickly. After about one hour the attack was slackening on our left and the presence of a bazooka, one or two tanks and the fire of automatic weapons made themselves more and more felt. Lieutenant Michard made his first call by radio. He repeated twice "We are established at the crossroads. We require reinforcements." I heard the call on my headphones but there was no response. We continued to manoeuvre and fire this way and that. About 30 and 60 minutes later the Lieutenant repeated with the same calm exactly the same message two or three times. There was no response. There was no longer any fight coming from our left. During our manoeuvres we had passed right round the fringes of Grussenheim alongside our infantry and the Lieutenant had talked with their officer. I don't know what he told him. After that he told me to manoeuvre faster "Faster Mécano". [Michard always called Dad "Mécano", Mechanic whilst in the tank.] He told me to return via the crossroads and advance into the village along the road coming from Jebsheim. One of the houses in this road was on fire and the smoke blew alongside us. I saw close by us some of our infantry, they took many shots from one side or the other. Montmirail arrived at an intersection with a road transversal to that which we were on. The Lieutenant told me to advance very gingerly and watch out to my left. From my position I could see a German tank facing us but with the turret not quite pointing towards us. I warned the Lieutenant and put us hard in reverse. A little while afterwards he told me to advance again, very slowly. The German tank was no longer there and we just had time to see the end of their cannon disappear. It was moving backwards down the road running parallel to ours. Our two tanks were separated by two rows of houses. Because we didn't want to put ourselves in their line of fire Lieutenant Michard told me to move backwards into the road we had just left. He told Mengual to load an armour piercing shell and Florkowski to turn the turret to the left. We fired the armour piercing shell through the houses to catch the German tank on the side, the events following proved that this was unsuccessful. After this we held on in Grussenheim manoeuvring from place to place without going near the road in which we saw the German tank waiting for us to pass. Our situation was untenable because we always had too few infantry. Lieutenant Michard told us we would try to take the German tank from behind so Montmirail returned to the crossroad at the entrance to the village. Before arriving there we heard some very sharp explosions of combat between tanks. We heard it was Arcis Sur Aube and a German tank. [Actually Arcis sur Aube had engaged a Jagdpanther] Lieutenant Michard gave me orders and we arrived at a place where in a second we saw the rear edge of a German tank disappear behind a wall it had just demolished to make its escape. 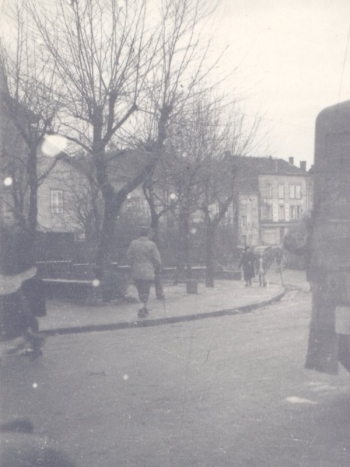 A few minutes later we saw two German tanks retreating from Grussenheim. They were already distant and had vanished before we could hit them. This greatly encouraged us. There were no longer the signs of battle we had seen at the other end of the village. We had been there about three hours. Our turret turned more and more slowly as the batteries began running flat. Lieutenant Michard talked with either the commander of Arcis Sur Aube or the infantry officer. We recommenced manoeuvring and Montmirail found the crossroad that we knew so well. The Lieutenant was always calm and very much the master of himself and the situation, which had now developed very favourably. He told me to penetrate the village and I turned Montmirail once more to the road which would take us into the interior of the village. The impact had damaged our turret which would now only turn by hand. Lieutenant Michard guided me in a reversing manoeuvre but before it was complete the orders ceased. I turned myself back to look into the turret and saw that the Lieutenant was upright. He had his arms crossed one on the other on the breach of the cannon and his head on his arms. He had a very small trickle of blood running down his forehead. He had to pause in his guidance of me. My young Co-Driver Casanova immediately began to get out of Montmirail to climb the turret and help the Lieutenant. Having got onto the tank there was an enormous risk of being hit by a rifle shot and he had to get back into his place. Our Gunner Florkowski told me to drive in reverse and guided me to a wall Just about as high as the turret. He told Casanova to climb into the turret where the Lieutenant was still standing and me to climb out onto the turret to pull. They pushed the Lieutenant and I positioned myself on the turret and placed my arms under his shoulders. We had difficulty lifting him. There was a small step inside the turret on which one could put a foot to get out or enter. One of my comrades placed the Lieutenants foot on this step and told him to push which he did without speaking. By doing this we were able to get upright onto the front side of the tank where one of my comrades rejoined me to help me get him down while under a hail of fire which missed all three of us. The Lieutenant had his eyes closed and they remained closed the whole time he was with us. He never complained, seeming to have nothing wrong and never put his hand to his head. I continued to hold him up by his shoulders and my comrade, I can no longer recall which, took the legs. The fire of arms we were exposed to obliged us to clamber down and during the descent the Lieutenant lost two large pieces of brain. It was not until this moment that we saw that he had a large hole in the back of his head close to the neck. Once on the ground we were all out of danger. We had deployed the stretcher which was kept on the back of Montmirail and had bandaged around the Lieutenants head, after which we laid him out. I remained at his side sitting down. After some moments without my having spoken to him he said "Save me." Since he had his eyes closed I told him "This is Eve speaking. You are out of the tank. You are saved." and this calmed him. A little while later while I was talking to someone beside the stretcher Lieutenant Michard sat himself up and tried to stand. He said again" Save me " and I repeated to him that he was saved and helped him to lie down. It seems unbelievable but he never had more than a little trickle of blood on his cheek and no blood on his uniform or on the stretcher. Arcis Sur Aube, the infantry and the half-tracks were reassembled next to Montmirail, I don't know how all this came about. One of the half-tracks had come close to Montmirail and it was decided that we would remain and the Lieutenant and some other wounded would be evacuated by half-track. We had no help with us. We placed the stretcher in the half-track with the wounded and it left with all speed towards Jebsheim amongst the crashing of shellfire. We saw it enter the village. At that moment we saw one or two of our tanks which seemed to stop at the edge of Jebsheim beside the road that lead to Grussenheim. We remounted Montmirail. Florkowski was tank commander and I don't recall if the gunner was Casanova or Mengual. I don't know what happened after that. A little while after Florkowski told me we were returning to Jebsheim and Montmirail, Arcis Sur Aube and the half-tracks set off again with all speed and without being hit by the German shells. I didn't see which tanks went to replace us but when I got out of Montmirail I saw that they were on the edge of Grussenheim. It was 4:20 or 4:30 and one could see night was approaching. We were out of our tanks and half-tracks behind the vines at the spot from which we had departed. We had a small French flag with the Cross of Lorraine which our Godmother had given us at Rabat. [French military personnel were given a Godmother or Adopter to send food parcels and enquire of their well-being] We had not unfurled it since the liberation of Paris and we fixed it on the spot provided on the turret of Montmirail as a sign of undimmed defiance. After a moment he looked at us and said "Another officer" and he began pacing slowly around Montmirail, watching his feet repeating "Another officer". He made three or four turns before he stopped before us and looked at us. He told us that Lieutenant Colonel Putz and one or two of his officers had been killed by a shell. I could only suppose that it was this and the death of Lieutenant de la Bourdonnaye that rendered the original attack impossible, necessitating our diversion. I don't know what our replacements found in Grussenheim but the following morning the front was beyond it. Lieutenant Michard had been mortally wounded in our final minutes of combat in this war. Captain de Witasse told us to rest the night at Jebsheim and he left towards Grussenheim. When I attempted to start the engine of Montmirail for the journey it was impossible because the batteries were dead flat. It was a sad moment. Montmirail needed towing ! The four tanks of our company and the platoon of infantry set off again the following morning with Captain de Witasse at front in a jeep followed by the tanks then the half-tracks. We took the same road that had led us to Grussenheim and returned to Sélestat. Either the same or the following afternoon General Leclerc came to see us. I recall that we went out onto the pavement in front of the house where we were staying and General Leclerc was there. There were 15 or 20 of us. Our tanks were not there. We lined up on the pavement, to attention. He did a simple inspection of us. General Leclerc was in the road and spoke to us simply. It was a moment both proud and sad because for the moment we were no longer in a state for combat. The day after Grussenheim we saw the doctor at the medical post. It was the same doctor I had known in Africa and who had known Lieutenant Michard. He told us that he was evacuated still alive but had died in the night. He also told us that if the Lieutenant had survived he would have been a complete invalid and would have recalled no one. "Lieutenant Louis Michard 28-1-45 F.F.L." Although we remained in the area one or two weeks we found it impossible to establish where he had been buried. We kept the cross in the Montmirail thinking to place it there one day. Before departing for Germany we burned it in a French field. Grussenheim was our last major combat and Lieutenant Michard was mortally wounded in the last 10 to 20 minutes of combat. 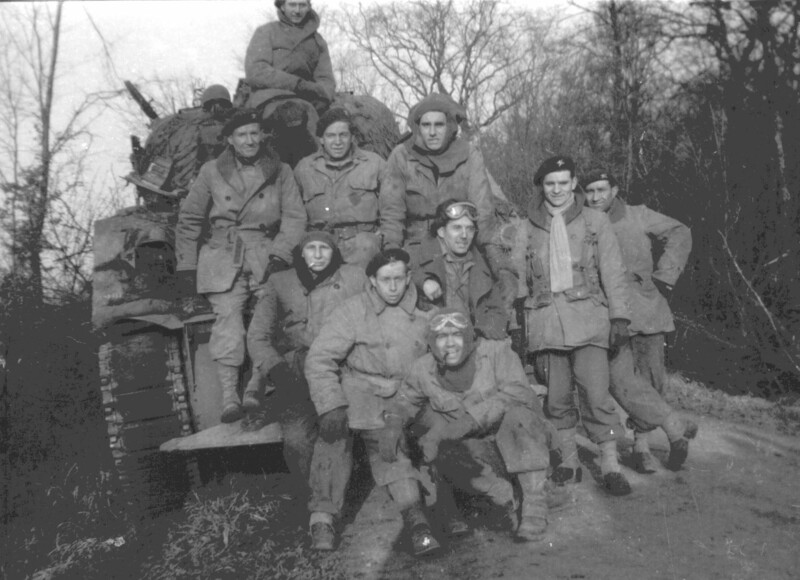 My story has been set down on 21st and 22nd February 1982 with a recollection that remains clear and devoted, by Lieutenant Michard's tank driver, member of his crew from February 1941 to 28th January 1945. Gaston Eve, 21 and 22 February 1982.